Julian Treslove is mugged one night in what he believes to be a misdirected act of anti-Semitism, an event that changes his whole sense of self. Mr. Jacobson doesn’t just summon Roth; he summons Roth at Roth’s best. This prizewinning book is a riotous morass of jokes and worries about Jewish identity, though it is by no means too myopic to be enjoyed by the wider world. It helps that Mr. Jacobson’s comic sensibility suggests Woody Allen’s, that his powers of cultural observation are so keen, and that influences as surprising as Lewis Carroll shape this book. Mr. Jacobson stages a Mad Seder that brings Carroll’s Mad Tea Party to mind … Treslove so loathes his old friend Finkler that he has turned ‘Finkler’ into his own private synonym for ‘Jew.’ So the real meaning of book’s title, The Finkler Question, is The Jewish Question, and that’s only where the Finklerisms begin. 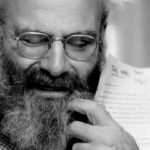 Obsessively, and with a razor-sharp acuity that justifies the Roth comparisons, Mr. Jacobson has Treslove begin cataloging what he thinks are Finkler traits, Finkler talents, Finkler customs and so on. What unifies all of this in Treslove’s mind is that they’re things he doesn’t have. 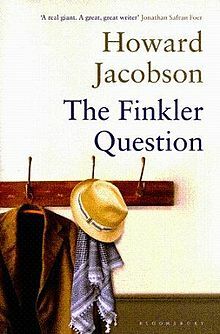 Although there is a plot, The Finkler Question is really a series of tragicomic meditations on one of humanity's most tenacious expressions of malice, which I realize sounds about as much fun as sitting shiva, but Jacobson's unpredictable wit is more likely to clobber you than his pathos … No other book has given me such a clear sense of the benevolent disguises that anti-Jewish sentiments can wear. And no one wears them more attractively than Julian Treslove, the handsome, middle-aged gentile at the center of The Finkler Question … Even while we're trying to disentangle what's so disturbing about Julian's special regard for Jews, the book pursues (and belabors) another line of comedy, this one about self-loathing Jews...Jacobson has stirred this pot before (and Philip Roth stirred it before him), but the novel's real depth develops slowly beneath the satire, as anti-Semitic attacks begin to filter into the story from around London and the world. Treslove doesn't approach his journey into Judaism from a religious standpoint. He takes no steps to learn Hebrew or convert. Instead, his obsession is cultural. He wishes to understand the mannerisms of Jewish life; the hidden code of Jewish sarcasm and the subtleties of Jewish body language … Jacobson isn't the first writer to delve into the question of Jewish identity, and he surely won't be the last. But he is definitely one of the most fearless…The Finkler Question tackles an uncomfortable issue with satire that is so biting, so pointed, that it pulls you along for 300 pages and leaves a battlefield of sacred cows in its wake … The book's appeal to Jewish readers is obvious, but like all great Jewish art — the paintings of Marc Chagall, the books of Saul Bellow, the films of Woody Allen — it is Jacobson's use of the Jewish experience to explain the greater human one that sets it apart. What did you think of The Finkler Question?